Mitochondria are organelles of eukaryotic cells fulfilling a variety of essential functions for life and death of the cells. They act in many biosynthetic and metabolic processes, such as oxidative phosphorylation, the citrate cycle, fatty acid oxidation and synthesis of Fe/S clusters. On the other hand, mitochondria are important for ageing and programmed cell death releasing pro-apoptotic proteins. Defects in mitochondrial processes cause a variety of diseases. Moreover, mitochondria dysfunction play an important role in many neurodegenerative diseases, such as Alzheimer and Parkinson. To fulfil their various functions they require a specific set of proteins. Nearly all of these mitochondrial proteins are encoded by nuclear DNA and synthesized in the cytoplasm as precursor proteins. 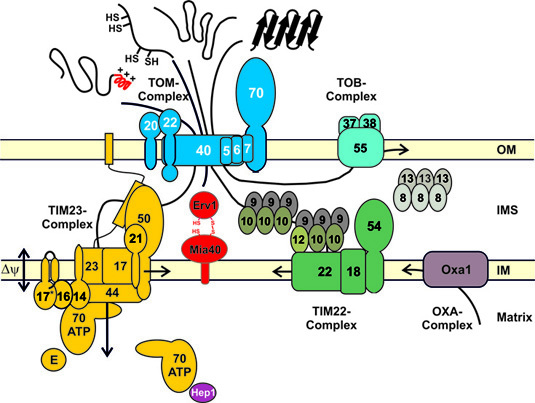 The precursor proteins are imported by oligomeric protein complexes, the translocases, into mitochondria and are subsequently sorted into one of the compartments of mitochondria: the outer membrane, the intermembrane space, the inner membrane or the matrix space.